The family Neritidae, known among aquarists as the Nerites, are a large group of marine and brackish water snails found primarily in coastal habitats such as reefs, tide pools, mangroves, and estuaries. A relatively small number live in freshwater habitats, usually forest and mountain streams where they forage on algae-covered rocks. Most species are rather small, typically less than an inch across, and most are very pretty, with shells that are glossy and marked with brilliant patterns and often bright colours. None breeds readily in aquaria, so problems with population control never occur, setting them apart from 'problem snails' like Malayan livebearing snails or pond snails. The main problem for the aquarist is clarifying whether the Nerites on sale are freshwater or brackish water species. Freshwater Nerites will obviously do well in freshwater aquaria, but brackish water species are much less reliable in this regard, and will exhibit a higher level of mortality in the long term. Unfortunately for the aquarist, some of the common names are either made up on the spot or applied loosely to multiple species. The zebra Nerite, for example, might be Puperita pupa, a North American brackish water species, or Neritina natalensis, a South African freshwater species. Unlike most of the other freshwater snails on the market, Nerites are relatively intolerant of pollution and poor water quality. It has to be borne in mind that these snails live in clean, fast-flowing streams rather than ponds, and they appreciate well-filtered water with plenty of oxygen. They are also more demanding in terms of water chemistry, and require hard, alkaline water to do well. When kept in insufficiently hard water their shells rapidly become pitted, losing much of their beauty. Ultimately, the snails seem to die if kept under such conditions. Brackish water species obviously need brackish water, ideally a specific gravity of 1.003-1.005 for the low salinity species or 1.010 upwards for the high salinity species. Nerites are algae eaters. Most consume green algae and diatoms, and some also eat blue-green algae. They do not eat live plants, and show little interest in meaty foods such as catfish pellets. Aquarists have not had much luck breeding Nerites. Many species simply do not lay eggs under aquarium conditions, and on the few occasions where it has been reported, only rarely have baby snails been produced. 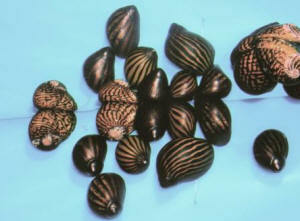 Nerites cannot reproduce without mating first, unlike Malayan livebearing snails. The most commonly traded Nerite appears to be the American species Vitta usnea, also known as the Virginia Nerite or olive Nerite and often sold under an obsolete Latin name, Neritina reclivata. It has a greenish-brown shell covered with thin dark and light green bands. Even the largest specimens are less than an inch across. In the wild species is found primarily in coastal marine habitats, in fresh, brackish, and saltwater conditions. But while it will prosper in hard, alkaline freshwater for long periods, perhaps indefinitely, there is some variability in this, and some batches, perhaps from more saline habitats, fail to adapt and die relatively quickly. In brackish water (SG 1.003 upwards) success is altogether more secure, and this is perhaps the ideal snail for low to moderate salinity aquaria. 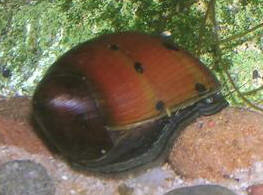 A species with a similar ecology is the Virginia Nerite Neritina virginea. This species is highly variable and very colourful. Shells may be red, purple, yellow, orange, brown or black, or any shade in between, and the pale, usually cream-coloured markings include everything from randomly distributed spots through to continuous bands that wind their way around the shell. This species need brackish to saltwater conditions in the aquarium. Another American species is zebra Nerite Puperita pupa, also found in brackish and marine waters. It has a basically white shell with an irregular, rather complex network of black stripes. This species is reputed to feed on blue-green algae, but unfortunately is not all that widely sold. Most of the Asian and African Nerites seem to be genuinely freshwater species, but they are almost never sold under a Latin name so confirming this is very difficult. The Asian spiny Nerites Clithon diadema and Clithon coronae are among the most distinctive of these snails. Having green or golden shells respectively, these snails have a whorl of short, slightly curved spines around the apex of the shell. Neritina natalensis and Vittina coromandeliana are African freshwater Nerites that may be sold under the zebra Nerite monicker, but they have light brown shells with dark brown to black stripes so are quite easily to distinguish from the brackish water Nerite Puperita pupa. Distinguishing them from one another, on the other hand, is tricky because both are exceedingly variable in terms of the regularity of the banding and the proportion of dark bands to light brown ground colour. Quite commonly traded are the snails sold as batman snails or horseshoe snails, which seem to be Neripteron auriculata, a freshwater species found across Southeast Asia, Australia, and various islands in the Indian and Pacific Oceans. These snails have an odd, limpet-like shape with a pair of short 'wings' on either side. Other Nerites appear all the time, under a variety of common names and almost never identified to species level. The second photo is a variety of Vittina turrita known as "Neritina semiconica" in the trade. Both photos are of true freshwater Nerite species.